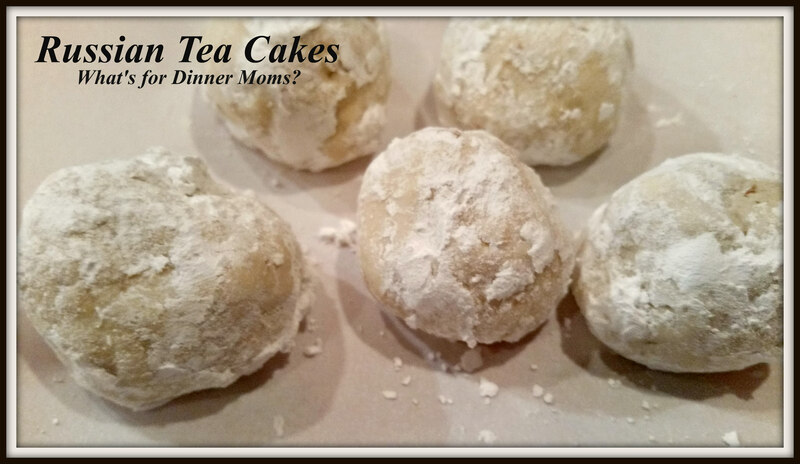 Russian Tea Cakes (or Mexican Wedding Cakes or Snowballs or ….) – What's for Dinner Moms? It seems hard to conceive that time is passing so quickly. There are only 14 days left until Christmas! Where has the month gone. We are still baking like crazy in our house. We are trying to fit it in among all the events that are happening this time of year. This Friday we have 2 Christmas parties, one Girl Scout Scavenger Hunt and Christmas Sing-a-Long and a Moxie Strings concert we are attending. All in one evening. It is all great and exciting things but you can only enjoy so many things at once. We are still trying to keep the cookie baking simple. These are cookies my mother used to make with us when we were younger. They go by many names but we always referred to them as Russian Tea Cakes. You can personalize this recipe a bit with your choice of nuts and extract. We mixed and baked a batch in under 30 minutes! How easy to have fresh cookies. If you are going to freeze these cookies I recommend freezing them before putting on the powdered sugar and then letting them defrost before sugaring them. These are so simple. They are essentially a shortbread cookie with nuts rolled in powdered sugar. These cookies are not the star of the show because they are so simple and plain but they have a great flavor and can be made in no time at all! These are a great addition to a dinner or buffet because they are so light and refreshing especially if you have a heavy meal. Preheat oven to 350 degrees. Place a sheet of parchment paper on a baking sheet. Mix butter, sugar and vanilla until well combined. Add flour and nuts in batches. Stir until everything is thoroughly mixed. Roll into 1″ balls and bake 10-12 minutes. Remove cookies from oven. Allow to cool slightly and then roll in powdered sugar. Omg, I love Russian tea cakes! You are busy! love the cookies! Need to slow down! Anyone have a time turner like in Harry Potter? Thank you! hahaha yes I am sure! Thanks for sharing, will try over the weekend !!!! Hope you like them! They ate so easy! These are the quintessential Christmas cookie in our house, Marci! I can taste them from here! Thank you! I love that they are so simple too! I have never made these..they look so delicious! They are so simple! You can change up the nuts, flavorings or even add cinnamon. Whatever YOU like! Love the recipe and the snow on your blog…I want some too! For snow – under settings, general about halfway down the page there is a box to check to have it snow on your site until January 4th! Hope this helps! Mine too! I love shortbread cookies.